Dr. Namita Wahi is a Fellow at the Centre for Policy Research, where she heads the Land Rights Initiative. Namita’s research interests are broadly in the areas of property rights, social and economic rights, and eminent domain or expropriation law. She has written extensively on these issues in various academic journals and edited volumes, as well as newspapers and magazines. 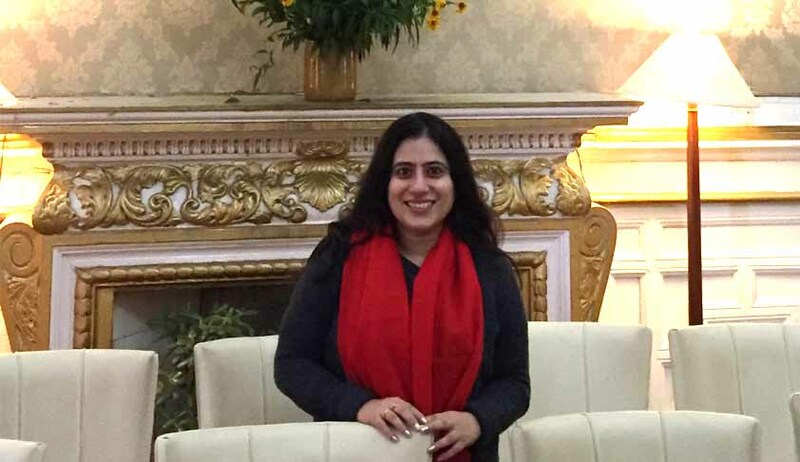 Namita has taught courses in these areas at Harvard University, both at the Law School and the Department of Government, and at NUJS, Kolkata. Previously, Namita worked as a litigator with Davis Polk and Wardwell in New York city, where she practised primarily in the areas of bankruptcy, securities, criminal defence and asylum law. Namita holds an LL.M. and S.J.D. in law from Harvard Law School, where she wrote her dissertation on “The Right to Property and Economic Development in India”, and BA and LLB (Hons.) degrees from the National Law School of India University, Bangalore. In this interview with LiveLaw, she answers some questions on demonetisation, and about the current projects with the Land Rights Initiative, which she heads at the CPR. LIVELAW: Please tell us about the current research projects with the Land Rights Initiative. What has been accomplished and what remains to be done? NAMITA WAHI: The Land Rights Initiative was set up in November 2014, to create an institutional space for facilitating systematic research on the state’s relationship to land in India. This is important because both the colonial and post-colonial Indian state, have been constantly reshaping property rights in India, in pursuance of their broader goals of economic development and social redistribution. Moreover, the Indian state is the largest owner and controller of land in India, and yet both the nature and extent of the state’s ownership and control of land is insufficiently documented. The continual reshaping of property rights in land in the exercise of the state’s police powers of regulating land use, and the power of eminent domain as seen in the land acquisition laws, has created a situation wherein land has become a major source of legal and extra-legal conflict in India, and also the site of large scale corruption in real estate transactions and political finance. Through our work based on an interdisciplinary engagement with these issues, we hope to meaningfully intervene in legal and policy debates on land regulation and management. More importantly, we believe that knowledge is empowerment and by building a knowledge bank on land issues, we can empower people to influence policy at the national, state, and district levels in the direction of equitable and efficient distribution of land and natural resources. The Initiative currently houses research projects on the “constitutional right to property”, “land acquisition”, and “land rights in the Scheduled Areas”. The “constitutional right to property project” is reviewing the chequered trajectory of the right to property in the Indian Constitution, from its inclusion as a fundamental right in 1950, through numerous amendments and ultimately its abolition as a fundamental right, and inclusion as a constitutional right in 1978. The Fundamental Right to Property enjoys the unique distinction of not only being the second most contentious provision in the drafting of the Constitution, but also the most amended provision, and the only fundamental right to be ultimately abolished in 1978. I am currently working on a book manuscript which covers the constitutional history of the right to property. The “land acquisition project” seeks to comprehensively review the law of land acquisition in India starting from the Land Acquisition Act, 1894 and up to the drafting and enforcement of the Right to Fair Compensation and Transparency in Land Acquisition, Rehabilitation and Resettlement Act, 2013 (“Land Acquisition Act, 2013”). Last year, we made submissions to the Joint Parliamentary Committee evaluating the Right to Fair Compensation and Transparency in Land Acquisition, Rehabilitation and Resettlement (Amendment) Bill, 2015. Despite its contentious nature, the debate on land acquisition has been marked by a lack of systematic and comprehensive data in support of particular positions. Existing studies on land acquisition have tended to focus on particular issues, like compensation, or on particular conflicts, or have been otherwise limited in terms of geography and time. We are currently in the process of completing a systematic and comprehensive quantitative and qualitative study of all land acquisition cases decided by the Supreme Court from 1950 to 2015. We have analysed these cases along various metrics, such as public purpose, procedure, compensation, invocation of the urgency clause, pendency of claims, and tracked trends with respect to distribution of conflicts across geography and time, and central and state laws. We plan to publish our final report on this study in March but the findings from the first phase of the project have been reported on by various leading national dailies. The “land rights in the Scheduled Areas” project is examining the question as to why despite the existence of a protective legal and administrative framework in the Fifth and Sixth Schedules of the Constitution, the Scheduled Tribes continue to remain the most vulnerable and impoverished sections of the population. Though Scheduled Tribes constitute only 8.2 per cent of the total population, they constitute 55 per cent of the people displaced since independence. Through archival research and case studies of four states, Gujarat, Andhra Pradesh, Telangana, and Meghalaya, the first three of which are Fifth Schedule states, and the last is a Sixth Schedule state, we are analysing the separate legal regime that governs property rights in the Scheduled areas. Despite the existence of state-wide land transfer prohibition laws that prevent transfer of land from tribals to non tribals, and the Forest Rights Act, 2006 (“FRA”), which makes provision for recognition of individual and community rights in forestland, our research has unearthed that only about 30 per cent of the Scheduled Tribes are resident within the tribal areas, and the numbers for those who have secure land rights are even lower. Further, our research shows that the displacement of the Scheduled Tribes is facilitated by the existence of a contrary legal regime, comprised of land acquisition, forests and mining laws, and an administrative apparatus comprised of the Forest bureaucracy that facilitated such displacement prior to the FRA, and which has resisted the implementation of the FRA post its enactment. LIVELAW: You have said in your Economic Times article that Supreme Court will not entertain challenges to the efficacy of the demonetisation policy, because on matters of economic policy, the court is likely to defer to the Government. But some experts feel it is not a policy matter because there is not a single economic rationale in its favour. NAMITA WAHI: I do not have the expertise to speak on whether there are more economic rationales in favour of the demonetisation measure or against. In fact, the demonetisation measure is so unprecedented in scale and scope that even economists are grappling with the enormity of its costs and benefits and what we know as of now is a lot of speculation. As judges are trained in law, the Supreme Court too does not possess the expertise to determine the efficacy of economic policy. That is a job for the government, who has the benefit of an army of bureaucrats, consultants and economic advisors to help them make this determination. The Supreme Court’s job is to ensure that the government acts within the bounds of its legally and constitutionally ordained powers. If the Court were to evaluate the efficacy of economic policy, then this would constitute judicial overreach and do an injustice to the letter and spirit of the constitutional separation of powers. LIVELAW: According to you Section 35A of the Banking Regulation Act - which the Government has relied on to defend itself - does not help the Government. Can you explain? to secure proper management of the banks. While the government can argue that “public interest” is a broad term that can justify the continuously shifting directions that the RBI has issued to banks on withdrawal limits from ATMs and bank accounts in the past month and a half, in my opinion that would be putting a stronger burden on these words than they are reasonably capable of bearing. If we look at the RBI directions issued under section 35A in the past, they mostly pertain to directions issued to particular banks that have been suffering from mismanagement, or general schemes like the appointment of a banking ombudsman. The legislative history of the RBI Act as noted by the Supreme Court in many decisions makes clear that the RBI was created as an independent expert body to control the banking system so as to ensure a stable financial and monetary system, and protect the interests of the depositors. Now, the demonetisation exercise has been hugely disruptive. The unprecedented scale and scope of the exercise along with the surprise element and the ostensible gap between the intent and implementation of the measure has meant that people have faced extraordinary hardship in accessing their own hard earned money. According to newspaper reports, approximately 100 people have lost their lives as a direct consequence of the demonetisation measure. Daily news reports are highlighting the loss of livelihoods and business of vast sections of the people, especially in rural India, where access to banking services is limited. This has necessitated continuous monitoring and speedily changing restrictions on bank withdrawals and deposits by the RBI, and the blanket restrictions on the cooperative banks, which have been partially eased by the RBI following court orders, which cannot necessarily be said to be in the interests of the depositors and has contributed to transitional instability in the economy. Even within the existing limits, banks are not able to meet the needs of the depositors who are seeking to withdraw money from their bank accounts because there isn’t enough cash. And we are speculating on the macro economic consequences of this measure, which won’t become clear for several months, and which in turn may or may not be in the depositors’ interests or the general public interest. So, in these circumstances, should the legal burden of running this massively disruptive exercise smoothly vest with an unelected body like the RBI, or with Parliament, which consists of the representatives of the people? By imposing this burden on the RBI, we will be undermining it as an institution. And that is precisely why the 1946 and 1978 demonetisation measures were undertaken through an ordinance, later replaced by an Act of Parliament. That is because, the demonetisation exercise requires much coordination between various branches of government, and much curtailment of individual rights that can be constitutionally done only through an ordinance or Act of Parliament. I am very happy to see that the cabinet has cleared an ordinance which is now awaiting presidential assent. They should have done that in the first place. We are also living in a time when since last year we have been grappling with reports of a looming banking crisis because of huge numbers of bad loans and non-performing assets by major banks. The extreme opacity of the banking system and the resistance of the RBI to be brought under the RTI Act, which was only recently overcome, have shielded the banking system from judicial scrutiny. Hitherto the Court has adopted a policy of extreme deference to the RBI. But perhaps, the time has come for the Court to heighten its scrutiny of the central bank. LIVELAW: You also say that the classification -which is implied - of bank account holders and non-account holders is an unfair discrimination. Is there any data on the number of people with bank accounts and those without? What if the Government claims that there are no restrictions on non-account holders from holding one, and the Government is entitled to assume that this would further expand and encourage the coverage of bank account holders? NAMITA WAHI: According to the 2011 Census, only 58.7% households had bank accounts. Of course, the PM’s massive push with the Jan Dhan Yojana has greatly increased banking coverage across the country, which is laudable. We don’t have completely reliable data on how many households have bank accounts now, although news reports have quoted figures from the Jan Dhan Yojana that all but 23,000 households have bank accounts. I cannot comment on the accuracy of the figures but the same data also suggested that prior to demonetisation, a majority of the bank accounts had zero cash balance. This is because while opening a bank account is a one-time activity, using it on a regular basis to deposit your savings requires easy access to the bank and trust in the banking institution. Bank coverage in India is not uniform. Many states like Bihar, Orissa and Madhya Pradesh do not have adequate banking networks vis-à-vis the needs of their population. The government can certainly incentivise people to open and use bank accounts, but when it penalises them for not doing so, as we have seen with the demonetisation exercise, with the discrimination between bank account holders and non-bank account holders, then it runs the danger of violating fundamental rights of the people. Moreover, even if we accept that every single household in the country has a bank account, that still does not mean that every individual has a bank account. The nature of internal household dynamics may be such that not everyone in the household would want to put their money in the household account. The many news reports on the depleted cash savings of women dependent upon their husbands’ incomes is testimony to that fact. Barring a few instances, the fundamental rights guaranteed in Part III of the Constitution are individual rights. Therefore, unless each adult individual has a bank account and has regular access to banking networks, the government’s demonetisation drive would have a differential impact on individuals with bank accounts and those without. The second kind of discrimination is between those who have accounts in cooperative banks and those who have accounts in regular banks. It is only pursuant to the Supreme Court’s directions that the government has eased restrictions on people seeking to exchange their money or deposit it in their accounts with cooperative banks. Now the cooperative banking network is very extensive in some states like Kerala, so people there have been particularly hit by the RBI restrictions pursuant to the demonetisation exercise. Any form of governmental discrimination involving a classification between two groups must satisfy the “rational basis” test. The test requires first that there is a reasonable classification between the two groups and second, that it must be based upon intelligible differentia that distinguishes persons or things that are grouped from others that are left out of the group. Now here since everyone was deprived from accessing their money, and needed a sum of money to ensure the exercise of their rights to life and livelihoods, it is not clear why those having bank accounts deserved favourable treatment as compared to those who don’t. With respect to the cooperative banks, they are governed by a dual structure of the NABARD and the RBI. It is not clear from the notifications issued by the RBI whether NABARD was consulted in imposing the restrictions on the cooperative banks. LIVELAW: If the classification of bank account holders and non-bank account holders through law or ordinance is permissible, even though on the face of it, it appears unreasonable, the Government may claim that the November 8 notification has not discriminated them, as it clearly said those without accounts also could exchange their old currencies with the new ones. NAMITA WAHI: It is true that the government in the original demonetisation notification permitted non account holders to exchange their old currency with the new one, but this was subject to a limit of 4,000 Rs in one transaction initially, and was later changed to Rs. 2000 following an RBI circular dated November 18, 2016. Compare this with the ability of bank account holders to put all their money in the bank account in one go and to withdraw Rs. 24,000 from their bank accounts. The discrimination between the ability of bank account holders and non-bank account holders to access their money, which is their property, is clear from these figures. LIVELAW: In Jayantilal v RBI, the Supreme Court did justify the demonetisation policy, right? NAMITA WAHI: In Jayantilal, the Supreme Court upheld the validity of the demonetisation ordinance without going into the merits of demonetisation as an economic policy, which as I mentioned earlier, the Court is not equipped to do, and where it rightly defers to government policy. However, the 1978 demonetisation, involving the steps of declaration of currency as illegal tender, and extinguishing the RBI’s debt to the public on the notes, as well as the restrictions on deposit of the notes and other penalties, had been done through an Ordinance, and not through an executive notification. Had the government in this case carried out demonetisation through an Ordinance, they would not have run afoul of the Constitution on most counts that I have outlined in my op ed. Jayantilal must also be distinguished from the instant case because it affected only 1% of the currency in circulation as opposed to the present case where it affects 86% of the currency in circulation. LIVELAW: Under Article 300A, why can’t the Government deprive the property of an individual through law with retrospective effect? After all, the Cabinet has announced that an Ordinance has been passed and is only awaiting the President’s signature. NAMITA WAHI: For any legal system, particularly one in a constitutional democracy to function effectively, laws must follow a certain “internal morality”. Rules must be of (1) general application, (2) publicly promulgated, (3) prospective (4) intelligible, (5) free of contradictions, (6) relatively constant, (7) possible to obey, and (8) administered in a way that does not wildly diverge from their obvious or apparent meaning. Therefore, retrospective operation of laws must be discouraged because it erodes the very sanctity of the legal system. The Supreme Court’s review of retrospective operation of laws has been rather deferential except in the case of criminal laws, and insofar as the penalty provisions of the Ordinance are concerned, they are prospective in nature so the Ordinance may withstand scrutiny on the retrospectivity question. But because of the retrospective nature of the Act, and the continuously shifting restrictions on people’s access to their own money, and the questionable administration of the entire demonetisation exercise, it can be said that the demonetisation exercise has run afoul of the internal morality of the law on various counts. There have been 74 notifications and circulars issued by the Ministry of Finance and the RBI in 50 days. As I said in my op ed, we live in a country governed by the “rule of law”, so anything that erodes the law’s internal morality is something that should be condemned and I hope that as the supreme interpreter of the law and the Constitution in India, the Supreme Court will uphold the internal morality of the law. Moreover, even if the Ordinance deprives people of their money by a law, any such deprivation must be for a “public purpose” and upon “payment of compensation”. Now, it can be argued that the demonetisation exercise has followed a public purpose, although it is not clear whether either of the purposes of eliminating fake currency or removing black money from the economy has in fact been achieved or could have been achieved with less restrictive alternatives. With respect to the stated justification on black money, it is estimated that only 6 per cent of black money is in cash, so whether this kind of massive disruption was the least restrictive, least harmful measure to achieve the objective of removing black money is not clear. The Supreme Court has until recently adopted a very deferential review of “public purpose”, but in the Singur case last year, Justice Gowda invoked strict scrutiny of whether something stated to be a public purpose by the government was in fact borne out by the facts of the case. Nevertheless, it is likely that the Court may find the exercise as satisfying the requirement of “public purpose”. However, even if demonetisation is done by law, and for a public purpose, the government is still required to compensate people for the deprivation of their property. Much has been made of the fact that the Ordinance if it extinguishes the liability of the RBI, will not run afoul of Article 300A because the deprivation of property will then happen through a law. But the Ordinance will still not validate the continuously shifting restrictions that the government has placed on people’s ability to access their money during this period, or the fact that banks have no cash so even if people wish to withdraw the money within those restrictions, they are unable to do so. Insofar as these restrictions violate individuals’ right to access their own money, it is still deprivation without compensation and can be said to constitute a form of creeping expropriation of their property. Usually, a creeping expropriation of property, which happens tangentially in the exercise of regular police powers, like zoning laws, need not be compensated. But this was not an instance of a tangential exercise of “police powers”, it was a measure that foreseeably caused a deprivation of people’s property which arguably must be compensated. News reports do not suggest that the Ordinance seeks to compensate people for the deprivation, so in that sense it can still be said to run afoul of Article 300A. LIVELAW: One of the questions referred to Constitution Bench is that the demonetisation exercise falls foul of Articles 14 and 19(1)(g). Your views? NAMITA WAHI: Article 14 guarantees to all people of India, equality before the law. Article 19(1)(g) guarantees to all citizens the right to freely practice their profession, trade or business throughout the territory of India. Article 19(1)(d) guarantees to citizens the right to freely move within the territory of India. In Saghir Ahmad and more recently in DTC v. D.T.C. Mazdoor Congress, Article 19(1)(g) was held to protect also the right to livelihood. Of course, the right to livelihood has also been read into the right to life under Article 21 in Olga Tellis and other cases. First, in the Bank nationalisation case and later in Maneka Gandhi v. Union of India, the Supreme Court outlined the composite code theory, according to which the guarantees under Articles 14, 19 and 21 constitute a composite code and any law or executive action that prima facie violates those rights, must be reasonably justified under each of those clauses. I have explained how the demonetisation notification prima facie violates the right to equality of various groups of people. Daily news reports make clear that a number of businesses have suffered huge losses due to demonetisation, and that workers employed in these businesses have been deprived of their livelihoods. The vast majority of these people are honest citizens and not black money hoarders. Therefore, there is a prima facie violation of people’s rights to trade, business and livelihood under Article 19(1)(g) and 21. When there is a prima facie restriction or violation of the fundamental rights of the people, the burden lies on the government to show that these restrictions are reasonable. The “reasonableness” of the restrictions has to be evaluated in light of the foreseeability of the impact on the population whose rights have been restricted, and also whether less restrictive, less harmful alternatives were available. That the withdrawal of 86 per cent of the cash in circulation in an economy where at least 68% of all transactions are in cash would have a severely restrictive impact on people’s rights to livelihood and business was foreseeable. The government has constantly been shifting the goal posts on what the goals of this exercise are, from black money to cashless or less cash economy. But the Supreme Court must hold the government to account on the stated goals of the demonetisation notification, elimination of terror financing through fake currency and eradication of black money, and if less restrictive, less harmful alternatives were available, then the demonetisation notification, even if partially validated by the Ordinance can nevertheless be found to be unconstitutional. And all those who have been deprived of their fundamental rights to livelihood, trade, movement and equality can arguably be said to have a valid cause of action against the government. The demonetisation case is undoubtedly one of the most important cases of our time because the unprecedented nature and scope of this action by a maximalist state, which threatens the exercise of the fundamental rights of the people, is exactly what the Supreme Court was created by the Constitution to safeguard against.